1. Vegan Products Have Less Saturated Fat – Saturated fats are found in meat and animal products like beef, lamb, butter, cheese, and high-fat dairy products. Consuming saturated fats increases the amount of cholesterol in your blood, which in turn raises your risk for heart disease and stroke. Eating four to five servings each of vegetables & fruits and vegan products such as coconut nectar, raw cacao butter, and organic cold processed chocolates (which contain mono-unsaturated fats and poly-unsaturated fats as well as flavonoids) can prevent heart disease and stroke. 2. Vegan Products Increase Fiber in Your Diet – A well-rounded, vegan-based diet should also increase the amount of fiber you get. Consuming food containing fiber is one way to reduce the bad cholesterol circulating in your body. Fiber comes in contact with the bad cholesterol in your digestive tract and helps remove it more quickly from your body. This decreases the overall amount of bad cholesterol absorbed in your body. Fiber is found in foods like beans, lentils, fruits, vegetables, and nuts. Hence, it is time to cut meat and add vegan products in your diet. 3. Eating Vegan Products Lowers Diabetes and Obesity Risks – Consuming higher amount of saturated fat is associated with an increased risk of type 2 diabetes. Having diabetes increases your chances of developing heart disease or stroke at an earlier age. Weight loss can also be due to the decrease in saturated fat that the body receives through the intake of plant-based diet. You can expect weight loss because vegan diet provides your body fewer calories and more water. This helps you fill up before you fill out. 4. Vegan Products Lower Blood Pressure – One well-known and often recommended diet for people with hypertension is the DASH (Dietary Approaches to Stop Hypertension) diet. While this diet is focused on reducing the amount of sodium in the diet, it also aims to lower meat intake. As per the DASH diet, the person has to increase the intake of fruits, vegetables vegan products such as cacao butter, coconut nectar, organic raw drinking chocolate, organic raw cacao sweet nibs to name a few. The proper DASH diet also lowers the blood pressure, which is known to be associated with increased risk of heart disease. 5. Vegan Diet Adds Beneficial Nutrients – A host of nutrients in a vegan diet are heart-protective. They are not only good, but organic, raw and whole foods. They help you reduce the risk of heart disease as they contain vital minerals, vitamins, amino acids, and other nutrients required by your body for healthy heart functioning. Be on your way to better health, more energy, and appreciate simpler things in life by consuming vegan products that are the best remedy for heart health. 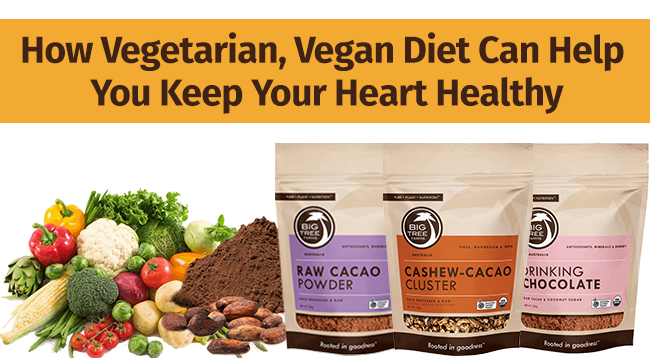 You can buy some of the organic raw foods such as raw cacao powder, raw cacao butter, coconut nectar & more from your favorite organic food store in Malaysia so that you can start your vegan diet today!